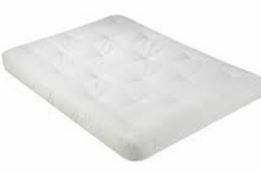 Falls Church futon mattress is 10" thick, Plush futon mattress with two 4-1/2" Bonded Polyester pads wrapped with fibron 2 cotton batting, covered with natural 6.5 OZ Duck fabric. Available in: Chair, Chair's ottoman, Twin, Full, Loveseat, Loveseat Ottoman, and queen sizes. All in off-White only.